The hubs came to me about a jalapeno cheesecake that a co-worker of his had saw. 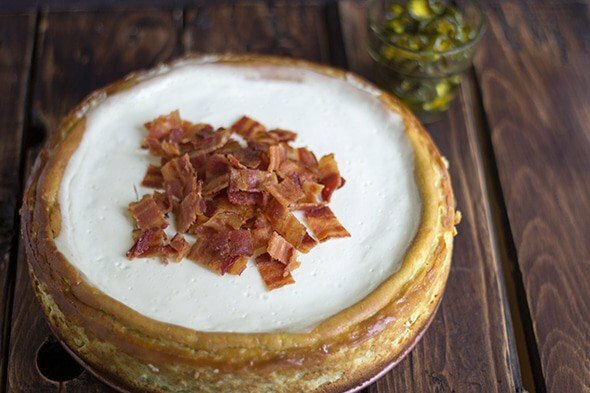 My first response was, “Ew, jalapeno cheesecake?” Well! 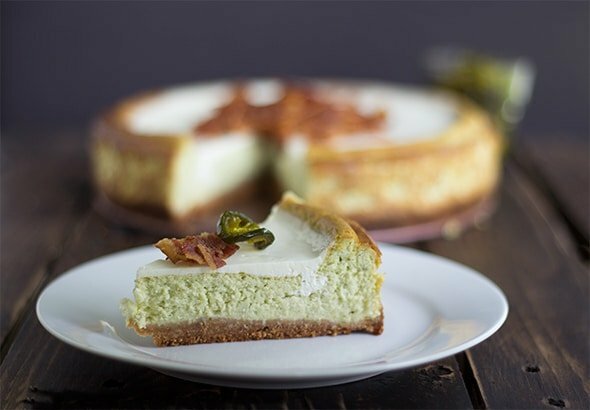 His co-worker had attempted a jalapeno cheesecake and that’s when I realized that it really was quite tasty. 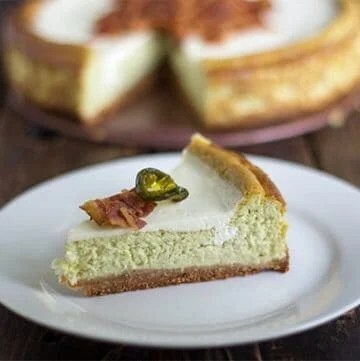 Of course, I had to make my own jalapeno popper cheesecake. When I tasted the raw batter I was like, “Oh my! I think I overdid the spice.” Don’t be afraid, the spice isn’t nearly as intense after the cheesecake is fully baked. Also, the cheesecake cracks, but the sour cream topping helps cover it up. 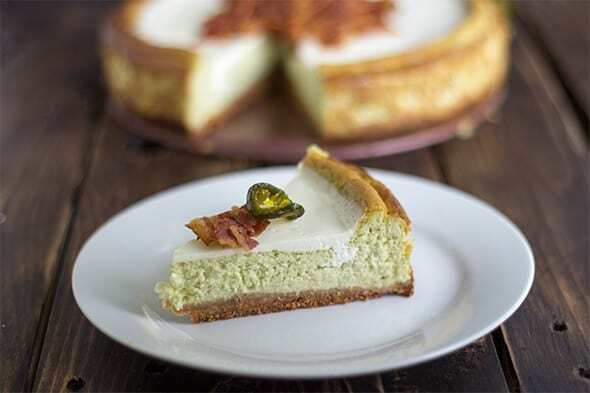 Do you know what one of my favorite things about this savory jalapeno popper cheesecake is? The beautiful light green color of the inside of the cake. Loveeeee. Also, I did not hot water bath the cheesecake which is why the edges are browned. I think it adds a wonderful rustic feel, but you can always hot water bath it. Your choice! In a food processor, place all the crackers in and pulse until all the crackers have been turned into crumbs. Add in the cheese, bacon, and melted butter. Pulse until the crumbs become moist and everything is incorporated. Press the crumbs into an 8 inch spring form pan. Wipe down the food processor so no crumbs get into the filling. Add in the cream cheese and jalapenos. Pulse until the jalapenos are finely minced. I left mine on high until there were only teeny weeny pieces of jalapenos. Add in the sugar, eggs, and sour cream and pulse until combined. Pour into the spring form pan on top of the crust. Place in the 350 degree oven for 1 hour. Prepare the topping before the 1 hour is up since the cheesecake needs to be put back into the oven. In a small bowl, add in the sour cream, lemon, and sugar, Whisk until incorporated. Once the hour of baking is up, pour the topping on the cheesecake and place back in the oven for another 15 - 20 minutes. Turn off the heat and crack the oven door. Let the cheesecake cool for about 2 hours. Place in the fridge to chill. Sprinkle with bacon pieces, cut, and serve. O.M.G. This may be the best thing I’ve ever seen. I want! This sounds awesome!!!!!! Can’t wait to try it! Thank you so much for this recipe! 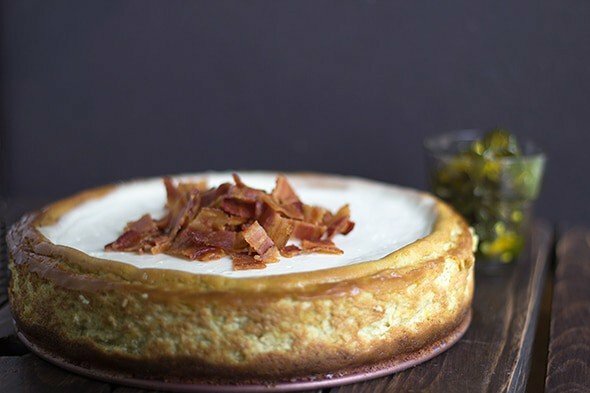 I was looking for a recipe like this when I saw Philadelphia cream cheese has a bacon flavor! Going to try it with at least one package of bacon cream cheese.